Plated Food Delivery Service cover's "almost"
So how is the Food Delivery Market doing? Not only is this market gaining momentum, it's about to boil over when millions of Shark Tank Fans discover how easy it is making Chef inspired meals complete with all the fresh ingredients delivered to your door. The two co-founders behind "Plated Food Delivery", Nick Taranto and Josh Hix, just got bumped up in the Shark Tank Episode line-up and will be appearing on the next Show this Friday night. Food Delivery system is carving out a nice little niche in this multi-billion dollar industry. Not just delivering a bunch of food to your door, but very select foods to make Gourmet Dinners inspired by the Plated Professional Chefs. You get all the ingredients, professional instructions to cook a healthy meal in less than 30 minutes, and delivered to your door guaranteed to be fresh. of $10 per month, or an annual membership for only $96 per year. Each plate cost $12 per person per meal, or $15 A-La-Carte. While the Plated Meals may not seem economical for a large family, the primary target market is focused on professional singles, dual household income earners, and aspiring Chef's. I remember reading an article in Entrepreneur Magazine 20 years ago about the first Fast Food Delivery Franchise to hit the market. I liked the concept then, and I like the concept now that the technology's catching up to make this a reality on a much larger scale. What's so unique about the Plated Food Delivery plan that sets this apart from all the competition is you can make Chef style meals without spending a half a day just gathering all the fresh ingredients. It might be a niche market, but a rather lucrative one that could propel the "Plated Ready-To-Cook Meals" into a household name. This Episode #528 was filmed in the Shark Tank last year, and it seems Hix and Taranto have not been sitting around waiting to see if they made the final cut for the Show. 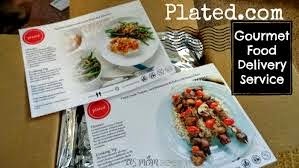 Just a few months ago in January, "Plated.com" successfully raised $5 million in a Series A funding led by FF Venture Capital. No doubt this business is gearing up in a big way, especially after the Shark Tank Show. Could the Sharks have already sunk their teeth in the Plated.com concept leading to such a successful round of funding just before the Show? Just knowing this single fact before the Show, will no doubt make watching this sales pitch that much more exciting. Use coupon code 20PLATED for $20 off your order. Awesome concept. These two guys are clearly very intelligent. They didn't handle some obvious objections well. You are pitching to five people that don't cook for themselves or really care how much their food costs. These five aren't their customers...at all. Look at two factors: 1) How much food a typically family spends on a weekly (or bi-weekly) grocery trip compared to the dollar value of how much is uneaten/thrown out. My wife and I throw out more food than I care to admit because we over-buy and under-cook. 2) The cost of eating out for a family of 2, 3, 4+. At the margin they quoted, roughly $10/person for a family of four. The Sharks made a point that they don't want to cook and these guys compete with restaurants who will cook for them. Look at the cost of ordering out from a restaurant. Not only are you paying for the food itself, you are paying the overhead on that food, overhead on the restaurant, and the restaurant's profits. A steak dinner for two, to take out, is easily $60-80, if not more. I get being in the moment, but being a sales guy, these two stood in front of a huge opportunity and really missed the easiest reasons their product is freaking awesome. Also, as someone who loves to cook, getting a delivery of exact proportions is great. It allows me to enjoy my passion for cooking and creating a meal from many ingredients. The experience of cooking for those who will clearly be their customers is something else they missed. The double-edged sword is, as someone who likes to cook (as I mentioned, :-)) is that I don't always like to follow recipes. I like to go off the book and just make something from what I have or feel like buying. That is my personality and just an objection to keep in mind.